EirMed’s design and engineering capabilities stem from our experienced engineers. EirMed’s engineering team has over 150 years of experience in plastics design for manufacture (DFM), medical molding and assembly. Each project has an assigned engineer who oversees every step of the process for consistent leadership and communication. Furthermore, the entire team works in collaboration to provide effective solutions. As part of the DFM process, our engineers analyze the part design to make determinations regarding the design of the tool. The use of integrated tooling software combined with our engineers’ experience enable us to create high quality molds for manufacturing. When tool prototyping, we build the tool according to the DFM process and perform tests to ensure the required results. EirMed is a full-service facility, we prototype and offer part analysis with the intention of long-term manufacturing. 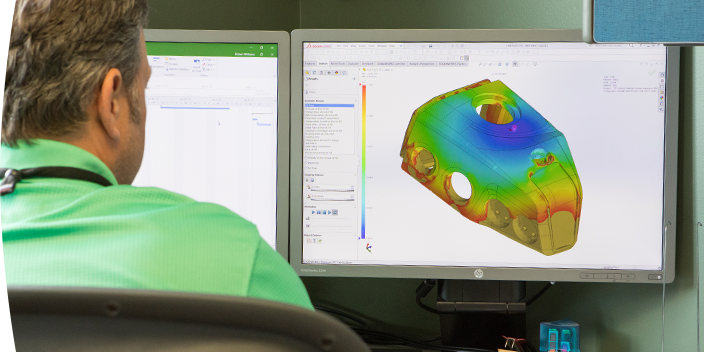 EirMed performs mold flow analysis on your part designs using the newest SolidWorks software featuring integrated design and mold flow capabilities. Our mold flow analysis helps EirMed make determinations of what materials are needed, and can identify potential failure points for the mold and the part design. We maintain a risk management system compliant with ISO and FDA guidelines. The system gives us the opportunity to mitigate any potential risks that may occur in development or post development.